Posted April 7, 2014 by Peter Varga & filed under CEO Insight. This December marks my 20th year at The Rapid. During my time here, we’ve seen a lot of changes. To name a few, there have been new routes and better frequencies to the planning and implementation of Michigan’s very first bus rapid transit line. And more service has brought more riders. In fact, I’m proud to say ridership has increased nearly four times since I arrived. We hit just under 3.5 million rides in 1994 and today we’re at 12.5 million rides. My first job in public transportation came when I was a bus driver many years ago in California. You could say I’m a life-long lover of public transportation. This is why I’m happy to share that it’s an exciting time for transit. Ridership is up and new technologies are being introduced almost every day as millennials are relying more on public transportation — not just across the nation, but also in the Great Grand Rapids area. The region has been growing and the urban centers have become more dynamic. Through this, it’s been great to be able to be part of the development of a transit system that’s meeting the challenges and excitement of a growing community. One aspect we’re focused on meeting for our growing community is making the public transportation experience easier and smarter. As a comparatively small public transit system, we know our resources may not be on par with more technologically advanced transit systems in San Francisco and Boston. But our intent is to be able to get there. Right now we’re looking forward to getting on Google Transit (it won’t be long before our data is vetted and available), investigating our future ticketing options including smart cards, and improving our rider tools for the tech-savvy millennial generation. 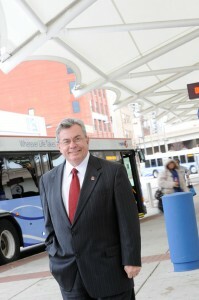 My work and passion for public transportation spans beyond the Greater Grand Rapids area. I’m currently the Chair of the American Public Transportation Association (APTA) where I work with other passionate transportation leaders around the country to improve the mobility choices of people throughout the nation. Since we’re at the beginning of a public transit renaissance in the U.S., I’m currently focused on articulating our vision for public transportation infrastructure. Over the years, one thing that hasn’t changed is our commitment to excellent customer service. I hope that our new Get on Board blog creates an added level of communication. If you have any on-topic questions for me, please feel free to comment on this blog post.